this past Saturday I co-hosted the Macy's Spring Essentials Fashion show brought to you by Miami Metropolitan International Fashion Week (MMIFW) and Miami Style Mafia. I had such a blast with my fellow co-hosts Ginger Harris of Electric Blogarella and Simonett Pereira of Miami Style Mafia and although I had moments filled with nerves, it all turned out fantastic. You see I am not much a public speaker, but I like to put myself through events that will provide me the opportunity to speak in public so that I can get more accustom to it, that is the only way I will grow. I did so much better than I thought and I was delighted with the results, I hope some of you who were there felt entertained and learned a few things. the top five trends we covered in the fashion show were - Neons, Prints, Lace, Graphics and Peplum and some of the brands that were featured where Rachel Rachel Roy (an exclusive brand of Macy's), Donald J. Pliner, I.N.C, Guess, Vince Camuto, Calvin Klein, Free People and French Connection. You can take a look at some of the outfits of the night that Ginger, Simonett and myself put together for you so that you can have an easier time getting ready everyday, you welcome. My absolute favorite outfit of the day was the blue peplum top with the red-striped white pants on the eighths picture below and which I called the "Fourth of July" look, so if you had been looking for a look for your Fourth of July festivities I think I just found you the one. 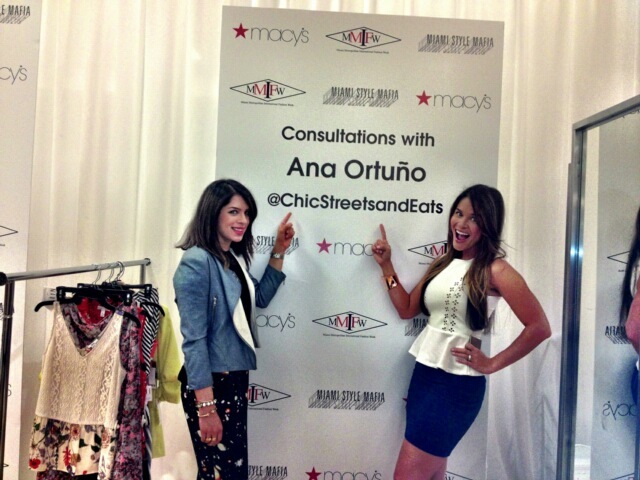 We also had our very own Trend Closets where you had the chance to get some styling tips from the three of us. The ninth and tenth pictures are some of the designs you will find during MMIFW, which starts on April 24, 2013 with a VIP Launch Party (find tickets here). thank you to those who came out and supported us, we had a few blogger friends and new bloggers whom we met and several girls who came up to say hi. There was a lady with two daughters who just had such a great time, she ended up buying a pair of laced shorts that Ginger presented and the blue peplum top of the "Fourth of July" look, I hope she is happy with them. Oh and thank you for all of our support team of stylist, the Paul Mitchell Hair and Make-up team, the Macy's team, Maxine, Michelle and all others who put it all together. Fun hanging out with you ladies!